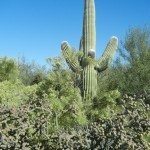 I have four Saguaros in my yard in various stages of maturity ranging from a large one that has been flowering for years to a small one that has some previous freeze damage and is very slow growing. All except the small appear to be very healthy. We live in NW Las Vegas, NV. My question pertains to the infrequent periods normally not exceeding a couple of weeks where the winter temperature gets into the 30 degree area. Should I cover the plants with burlap as a precaution? Saguaros are supposed to be able to tolerate brief temperatures as low as 14 degrees F. Some experts warn against wrapping saguaros in burlap, because in wet weather it can trap water against the cactus and cause rot. A better protection method is to cover the tips of the arms with a styrofoam cup or similar, since they are the most easily damaged.